Coin showing (obverse) head of the late Roman emperor Julian (ruled 361–363 AD) wearing diadem and (reverse) soldier bearing standard holding kneeling barbarian captive by the hair, legend and Myth VIRTUS EXERCITUS ROMANORUM ("Valour of Roman army"). Gold solidus. Sirmium mint. The Roman army (Latin: exercitus Romanus) was the terrestrial armed forces deployed by the Romans throughout the duration of Ancient Rome, from the Roman Kingdom (to c. 500 BC) to the Roman Republic (500–31 BC) and the Roman Empire (31 BC – 395), and its medieval continuation the Eastern Roman Empire. It is thus a term that may span approximately 2,206 years (753 BC to 1453 AD), during which the Roman armed forces underwent numerous permutations in composition, organisation, equipment and tactics, while conserving a core of lasting traditions.. The Early Roman army was the armed force of the Roman Kingdom and of the early Republic (to c. 300 BC). During this period, when warfare chiefly consisted of small-scale plundering raids, it has been suggested that the army followed Etruscan or Greek models of organisation and equipment. The early Roman army was based on an annual levy. The infantry ranks were filled with the lower classes while the cavalry (equites or celeres) were left to the patricians, because the wealthier could afford horses. Moreover, the commanding authority during the regal period was the high king. Until the establishment of the Republic and the office of consul, the king assumed the role of commander-in-chief. However, from about 508 BC Rome no longer had a king. The commanding position of the army was given to the consuls, "who were charged both singly and jointly to take care to preserve the Republic from danger". The term legion is derived from the Latin word legio; which ultimately means draft or levy. At first there were only four legions. These legions were numbered "I" to "IIII", with the fourth being written as such and not "IV". The first legion was seen as the most prestigious. The bulk of the army was made up of citizens. These citizens could not choose the legion to which they were allocated. Any man "from ages 16–46 were selected by ballot" and assigned to a legion. The Roman army of the mid-Republic was also known as the "manipular army" or the "Polybian army" after the Greek historian Polybius, who provides the most detailed extant description of this phase. The Roman army started to have a full-time strength of 150,000 at all times and 3/4 of the rest were levied. During this period, the Romans, while maintaining the levy system, adopted the Samnite manipular organisation for their legions and also bound all the other peninsular Italian states into a permanent military alliance (see Socii). The latter were required to supply (collectively) roughly the same number of troops to joint forces as the Romans to serve under Roman command. Legions in this phase were always accompanied on campaign by the same number of allied alae (Roman non-citizen auxiliaries), units of roughly the same size as legions. After the 2nd Punic War (218–201 BC), the Romans acquired an overseas empire, which necessitated standing forces to fight lengthy wars of conquest and to garrison the newly gained provinces. Thus the army's character mutated from a temporary force based entirely on short-term conscription to a standing army in which the conscripts were supplemented by a large number of volunteers willing to serve for much longer than the legal six-year limit. These volunteers were mainly from the poorest social class, who did not have plots to tend at home and were attracted by the modest military pay and the prospect of a share of war booty. The minimum property requirement for service in the legions, which had been suspended during the 2nd Punic War, was effectively ignored from 201 BC onward in order to recruit sufficient volunteers. Between 150-100 BC, the manipular structure was gradually phased out, and the much larger cohort became the main tactical unit. In addition, from the 2nd Punic War onward, Roman armies were always accompanied by units of non-Italian mercenaries, such as Numidian light cavalry, Cretan archers, and Balearic slingers, who provided specialist functions that Roman armies had previously lacked. The Roman army of the late Republic (88–30 BC) marks the continued transition between the conscription-based citizen-levy of the mid-Republic and the mainly volunteer, professional standing forces of the imperial era. The main literary sources for the army's organisation and tactics in this phase are the works of Julius Caesar, the most notable of a series of warlords who contested for power in this period. As a result of the Social War (91–88 BC), all Italians were granted Roman citizenship, the old allied alae were abolished and their members integrated into the legions. Regular annual conscription remained in force and continued to provide the core of legionary recruitment, but an ever-increasing proportion of recruits were volunteers, who signed up for 16-year terms as opposed to the maximum 6 years for conscripts. The loss of ala cavalry reduced Roman/Italian cavalry by 75%, and legions became dependent on allied native horse for cavalry cover. This period saw the large-scale expansion of native forces employed to complement the legions, made up of numeri ("units") recruited from tribes within Rome's overseas empire and neighbouring allied tribes. Large numbers of heavy infantry and cavalry were recruited in Spain, Gaul and Thrace, and archers in Thrace, Anatolia and Syria. However, these native units were not integrated with the legions, but retained their own traditional leadership, organisation, armour and weapons. During this period the Republican system of citizen-conscription was replaced by a standing professional army of mainly volunteers serving standard 20-year terms (plus 5 as reservists), although many in the service of the empire would serve as many as 30 to 40 years on active duty, as established by the first Roman emperor, Augustus (sole ruler 30 BC – AD 14). Regular annual conscription of citizens was abandoned and only decreed in emergencies (e.g. during the Illyrian revolt 6–9 AD). Under Augustus there were 28 legions, consisting almost entirely of heavy infantry, with about 5,000 men each (total 125,000). This had increased to a peak of 33 legions of about 5,500 men each (c. 180,000 men in total) by AD 200 under Septimius Severus. Legions continued to recruit Roman citizens, mainly the inhabitants of Italy and Roman colonies, until 212. Legions were flanked by the auxilia, a corps of regular troops recruited mainly from peregrini, imperial subjects who did not hold Roman citizenship (the great majority of the empire's inhabitants until 212, when all were granted citizenship). Auxiliaries, who served a minimum term of 25 years, were also mainly volunteers, but regular conscription of peregrini was employed for most of the 1st century AD. The auxilia consisted, under Augustus, of about 250 regiments of roughly cohort size, that is, about 500 men (in total 125,000 men, or 50% of total army effectives). Under Severus the number of regiments increased to about 400, of which about 13% were double-strength (250,000 men, or 60% of total army). Auxilia contained heavy infantry equipped similarly to legionaries, and almost all the army's cavalry (both armoured and light), and archers and slingers. The Late Roman army period stretches from (284–476 AD and its continuation, in the surviving eastern half of the empire, as the East Roman army to 641). In this phase, crystallised by the reforms of the emperor Diocletian (ruled 284–305 AD), the Roman army returned to regular annual conscription of citizens, while admitting large numbers of non-citizen barbarian volunteers. However, soldiers remained 25-year professionals and did not return to the short-term levies of the Republic. The old dual organisation of legions and auxilia was abandoned, with citizens and non-citizens now serving in the same units. The old legions were broken up into cohort or even smaller sizes. At the same time, a substantial proportion of the army's effectives were stationed in the interior of the empire, in the form of comitatus praesentales, armies that escorted the emperors. The Middle Byzantine army (641–1081 AD) was the army of the Byzantine state in its classical form (i.e. after the permanent loss of its Near Eastern and North African territories to the Arab conquests after 641 AD). This army was largely composed of semi-professional troops (soldier-farmers) based on the themata military provinces, supplemented by a small core of professional regiments known as the tagmata. Ibn al-Fakih estimated the strength of the themata forces in the East c. 902 at 85,000 and Kodama c. 930 at 70,000. This structure pertained when the empire was on the defensive, in the 10th century the empire was increasingly involved in territorial expansion, and the themata troops became progressively more irrelevant, being gradually replaced by 'provincial tagmata' units and an increased use of mercenaries. The Komnenian Byzantine army was named after the Komnenos dynasty, which ruled from 1081–1185. This was an army built virtually from scratch after the permanent loss of half of Byzantium's traditional main recruiting ground of Anatolia to the Turks following the Battle of Manzikert in 1071, and the destruction of the last regiments of the old army in the wars against the Normans in the early 1080s. It survived until the fall of Constantinople to the Western crusaders in 1204. This army had a large number of mercenary regiments composed of troops of foreign origin such as the Varangian Guard, and the pronoia system was introduced. The Palaiologan Byzantine army was named after the Palaiologos dynasty (1261–1453), which ruled Byzantium from the recovery of Constantinople from the Crusaders until its fall to the Turks in 1453. Initially, it continued some practices inherited from the Komnenian era and retained a strong native element until the late 13th century. During the last century of its existence, however, the empire was little more than a city-state that hired foreign mercenary bands for its defence. Thus the Byzantine army finally lost any meaningful connection with the standing imperial Roman army. Some of the Roman army's many tactics are still used in modern-day armies today. Until c. 550 BC, there was no "national" Roman army, but a series of clan-based war-bands which only coalesced into a united force in periods of serious external threat. Around 550 BC, during the period conventionally known as the rule of king Servius Tullius, it appears that a universal levy of eligible adult male citizens was instituted. This development apparently coincided with the introduction of heavy armour for most of the infantry. Although originally low in numbers the Roman infantry was extremely tactical and developed some of the most influential battle strategies to date. The early Roman army was based on a compulsory levy from adult male citizens which was held at the start of each campaigning season, in those years that war was declared. There were no standing or professional forces. During the Regal Era (to c. 500 BC), the standard levy was probably of 9,000 men, consisting of 6,000 heavily armed infantry (probably Greek-style hoplites), plus 2,400 light-armed infantry (rorarii, later called velites) and 600 light cavalry (equites celeres). When the kings were replaced by two annually elected praetores in c. 500 BC, the standard levy remained of the same size, but was now divided equally between the Praetors, each commanding one legion of 4,500 men. The central feature of the Roman army of the mid-Republic, or the Polybian army, was the manipular organization of its battle-line. Instead of a single, large mass (the phalanx) as in the Early Roman army, the Romans now drew up in three lines consisting of small units (maniples) of 120 men, arrayed in chessboard fashion, giving much greater tactical strength and flexibility. This structure was probably introduced in c. 300 BC during the Samnite Wars. Also probably dating from this period was the regular accompaniment of each legion by a non-citizen formation of roughly equal size, the ala, recruited from Rome's Italian allies, or socii. The latter were c. 150 autonomous states which were bound by a treaty of perpetual military alliance with Rome. Their sole obligation was to supply to the Roman army, on demand, a number of fully equipped troops up to a specified maximum each year. The Polybian army's operations during its existence can be divided into three broad phases. (1) The struggle for hegemony over Italy, especially against the Samnite League (338–264 BC); (2) the struggle with Carthage for hegemony in the western Mediterranean Sea (264–201 BC); and (3) the struggle against the Hellenistic monarchies for control of the eastern Mediterranean (201–91 BC). During the earlier phase, the normal size of the levy (including allies) was in the region of 40,000 men (2 consular armies of c. 20,000 men each). 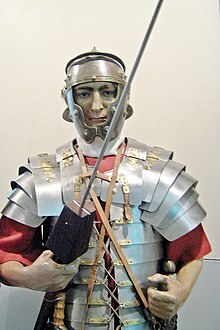 Recreation of a Roman soldier wearing plate armour (lorica segmentata), National Military Museum, Romania. Ancient Roman statue fragment of either a general or an emperor wearing a corselet decorated with Selene, and two Nereids. Found at èmegara, dating from 100-130 AD. 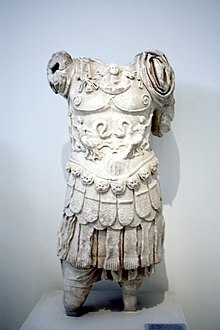 Under the founder–emperor Augustus (ruled 30 BC – 14 AD), the legions, c. 5,000-strong all-heavy infantry formations recruited from Roman citizens only, were transformed from a mixed conscript and volunteer corps serving an average of 10 years, to all-volunteer units of long-term professionals serving a standard 25-year term (conscription was only decreed in emergencies). In the later 1st century, the size of a legion's First Cohort was doubled, increasing legionary personnel to c. 5,500. The military chain of command was relatively uniform across the Empire. In each province, the deployed legions' legati (legion commanders, who also controlled the auxiliary regiments attached to their legion) reported to the legatus Augusti pro praetore (provincial governor), who also headed the civil administration. The governor in turn reported direct to the emperor in Rome. There was no army general staff in Rome, but the leading praefectus praetorio (commander of the Praetorian Guard) often acted as the emperor's de facto military chief-of-staff. Legionary rankers were relatively well-paid, compared to contemporary common labourers. Compared with their subsistence-level peasant families, they enjoyed considerable disposable income, enhanced by periodic cash bonuses on special occasions such as the accession of a new emperor. In addition, on completion of their term of service, they were given a generous discharge bonus equivalent to 13 years' salary. Auxiliaries were paid much less in the early 1st century, but by 100 AD, the differential had virtually disappeared. Similarly, in the earlier period, auxiliaries appear not to have received cash and discharge bonuses, but probably did so from Hadrian onwards. Junior officers (principales), the equivalent of non-commissioned officers in modern armies, could expect to earn up to twice basic pay. Legionary centurions, the equivalent of mid-level commissioned officers, were organised in an elaborate hierarchy. Usually risen from the ranks, they commanded the legion's tactical sub-units of centuriae (c. 80 men) and cohorts (c. 480 men). They were paid several multiples of basic pay. The most senior centurion, the primus pilus, was elevated to equestrian rank upon completion of his single-year term of office. The senior officers of the army, the legati legionis (legion commanders), tribuni militum (legion staff officers) and the praefecti (commanders of auxiliary regiments) were all of at least equestrian rank. In the 1st and early 2nd centuries, they were mainly Italian aristocrats performing the military component of their cursus honorum (conventional career-path). Later, provincial career officers became predominant. Senior officers were paid enormous salaries, multiples of at least 50 times basic. A typical Roman army during this period consisted of five to six legions. One legion was made up of 10 cohorts. The first cohort had five centuria each of 160 soldiers. In the second through tenth cohorts there were six centuria of 80 men each. These do not include archers, cavalry or officers. Soldiers spent only a fraction of their lives on campaign. Most of their time was spent on routine military duties such as training, patrolling, and maintenance of equipment etc. Soldiers also played an important role outside the military sphere. They performed the function of a provincial governor's police force. As a large, disciplined and skilled force of fit men, they played a crucial role in the construction of a province's Roman military and civil infrastructure: in addition to constructing forts and fortified defences such as Hadrian's Wall, they built roads, bridges, ports, public buildings, entire new cities (Roman colonies), and also engaged in large-scale forest clearance and marsh drainage to expand the province's available arable land. The army of the Principate underwent a significant transformation, as a result of the chaotic 3rd century. Unlike the Principate army, the army of the 4th century was heavily dependent on conscription and its soldiers were more poorly remunerated than in the 2nd century. Barbarians from outside the empire probably supplied a much larger proportion of the late army's recruits than in the army of the 1st and 2nd centuries. The 3rd and 4th centuries saw the upgrading of many existing border forts to make them more defensible, as well as the construction of new forts with much higher defensive specifications. The interpretation of this trend has fuelled an ongoing debate whether the army adopted a defence-in-depth strategy or continued the same posture of "forward defence" as in the early Principate. Many elements of the late army's defence posture were similar to those associated with forward defence, such as a looser forward location of forts, frequent cross-border operations, and external buffer-zones of allied barbarian tribes. Whatever the defence strategy, it was apparently less successful in preventing barbarian incursions than in the 1st and 2nd centuries. This may have been due to heavier barbarian pressure, and/or to the practice of keeping large armies of the best troops in the interior, depriving the border forces of sufficient support. ^ Vegetius, The Military Institutions of the Romans (J. Clark, transl.) Harrisburg Penn. ; 1944. ^ Dando-Collins, Stephen. Legions of Rome. New York: St. Martin's Press, 2010. ^ Southern, Pat. The Roman Army: A Social and Institutional History. Oxford, England: Oxford University Press, 2007. ^ Heath, Ian (1979). Byzantine armies, 886-1118. Osprey. p. 19. ISBN 978-0850453065.